Moist Carrot Cake with Thick Cream Cheese Frosting - Made It. Ate It. Loved It. If there is any dessert that screams Easter to me it is Carrot Cake. And luckily it is my husbands favorite! That is always his birthday cake of choice! This recipe always hits the spot! 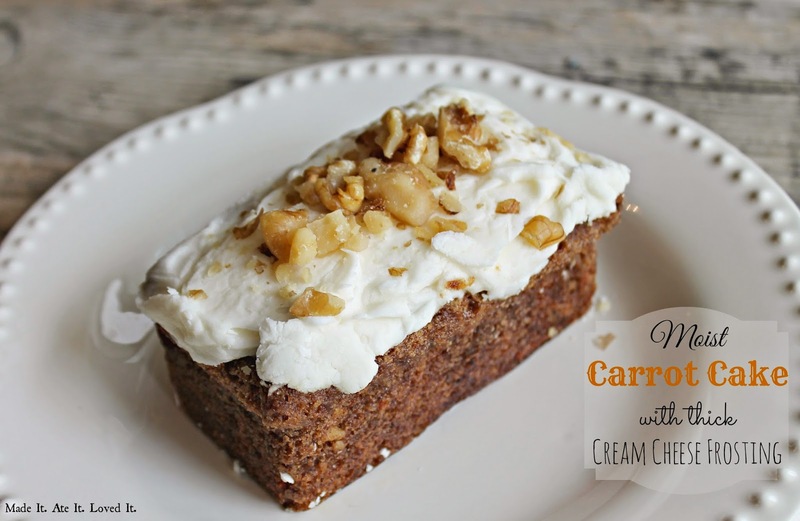 I love to top mine with thick cream cheese frosting with a little nutmeg in it and some chopped walnuts! Preheat oven to 350 degrees F. Combine sugar, oil and eggs. Sift all dry ingredients together and slowly add into wet mixture. Add grated carrots and chopped walnuts. Pour into greased pan. 9 inch rounds cook for 50 minutes. Mini loaves cook for 20-23 minutes. Let cool then frost with cream cheese frosting and top with more walnuts if you want. Mix ingredients all together and then frost cakes once they are cooled.